The NBA finals just ended and the Cleveland Cavaliers took home the championship trophy. The stunning trophy, covered in gold, is testament to the flash and prestige of sports leagues across the globe. Each major sporting group has its own way of doing things, complete with stunning performances, millions of screaming fans and an impressive grand prize at the end. Although the debate over which sport is best will rage on forever, we can answer the question which sports league makes the most money? 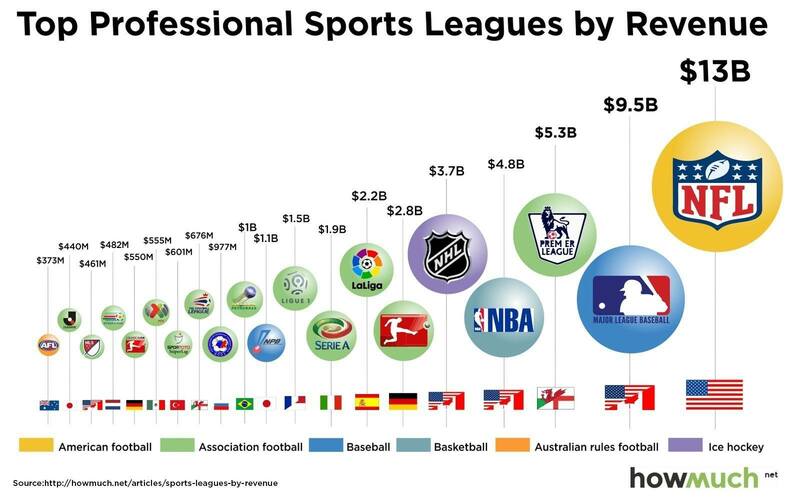 Below you will find an infographic of the wealthiest sports leagues by revenue. You can see the top 20 sports teams shown by each individual logo in order of revenue from right to left, with revenues placed above each logo. There are two major patterns that can be seen from our infographic. First, football leagues dominate the top chart. Now, there is a big debate over the use of the term football. America and a few other countries use the term soccer, while most of the world uses the term football. Either way, it’s an extremely popular sport. Out of the top 20 leagues by revenue, 14 are associated football groups. These leagues make a combined $19.442 billion and most of them are unsurprisingly located in Europe. You may also be able to see the popularity of a sport in a certain region. European football leagues enjoy large revenues due to their popularity. Although America’s Major League Soccer (MLS) takes the 18th spot on our list, its revenues are well below the major European football leagues. In comparison, the Premier League in England and Wales makes $5.3 billion, making it the top football league by revenue. The second major trend that you should notice is that the top 5 positions are dominated by American/Canadian sports leagues. Not only are 4 out of the top 5 positions held by American/Canadian leagues, the revenue of these leagues far outpaces all others. The National Football League alone commands $13 billion in revenue, giving it the top spot overall by a huge amount. The combined revenues of the NFL and MLB are equal to $22.5 billion, surpassing the top 14 football leagues. When you add in the NBA and NHL, the combined revenue is $31 billion, which is much more than the other 16 top sports leagues in total. Another smaller trend to notice is the diversity of sports leagues in America and Canada. While all of Europe’s top sports leagues involve football, America’s and Canada’s top leagues by revenue span 5 different sports: American Football, Baseball, Basketball, Ice Hockey and Football (soccer). Europeans as well as others certainty enjoy their football, while American and Canadians seem to enjoy a more diverse set of sports. Although football leagues are various and post decent revenues, the sports leagues coming out of North America make far more money. Which Professional Sports Leagues Make the Most Money?